The Internet is doing incalculable damage to our brains—or so the chest-beating of recent years would have you believe. Thanks to Twitter, Facebook, and RSS feeds, the argument goes, we now suffer from short-circuited attention spans, leaving us unable to sit down and read a good book or even a long magazine article without a bit of digital multitasking. While the Cassandras spend their time writing good books and long magazine articles about the phenomenon, something interesting is taking place. Long-form writing—both fiction and non-fiction—is flourishing. And the iPad is giving the format a new platform on which to thrive. Need proof? Consider the success of the iBooks and Kindle apps, which typically rank among the most-downloaded free offerings in the iOS App Store. But there’s also been a quiet proliferation of other offerings that make it easy to curl up and spend a quiet, contemplative afternoon with the iPad. But which services and apps deserve your attention? We’ve looked around the App Store—and beyond—to find offerings that make long-form writing come to life on the iPad. Since the Internet first came into widespread public use, aggregation sites have offered Web surfers links to content from around the ’Net—Arts & Letters Daily is among the best-known and longest-lived. But the popularity of apps like Instapaper and Read It Later have inspired a younger crop of sites devoted to featuring and popularizing the best long magazine-form writing—sites like Longform.org, Give Me Something to Read, and Longreads, whose Twitter feeds are great additions to your Flipboard app for replicating the magazine-flipping experience. If you’re looking for an iOS offering that does all the aggregating for you, TheBrowser.com’s “best of the moment” app, BotmHD ( ), might merit some attention. Each day, editors select five to ten pieces of eclectic online nonfiction—from magazines, journals, blogs, and even video sources—and collect them for easy viewing within the app. BotmHD delivers up to 10 pieces of online non-fiction to your iPad each day. There’s a problem, though—BotmHD doesn’t provide a way to save or bookmark interesting pieces for later reading or to download them for offline viewing. That limits the app’s usefulness, but the editorial selection is so interesting that you might want to use mobile Safari to access The Browser’s Website. From there, you can use Instapaper or Read It Later to capture that content for later reading. While aggregation services largely pick up magazine-style writing that’s already available in print, other writers and publishers are looking at ways to create new forms of content that better match the digital format. The result is something of a hybrid—longer than a magazine story but shorter than a full-blown book, often with multimedia augmentation you can’t get from print alone. Among The Atavist’s many multimedia tricks is an audio version of the story that’s read by a human voice, not a computerized one. Cartoons, essays, stories, and poems are among the content found in Narrative. 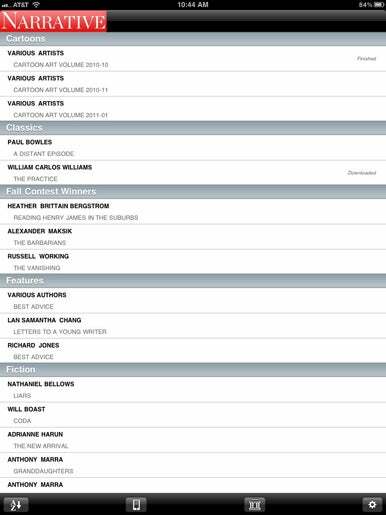 While the Kindle Singles can be read on a variety of devices, The Atavist app ( ) is aimed squarely at users of the iPhone and iPad. The Atavist is free, but it lets users buy long-form stories from within the app for $3. The Atavist has an array of multimedia tricks up its sleeve to keep you engaged. One story, “Piano Demon,” plays an album-length soundtrack of music by the story’s subject, Chicago jazzman Teddy Weatherford, while you read. (This feature can be turned off if you wish.) If your eyes are tired or you’re otherwise engaged, you can listen to an audio version of the story—read by a human, not a computer like on Amazon’s Kindle—and return to the printed text at any spot you choose. The only shortcoming? There’s still a very limited selection of stories from which to choose. The offerings we’ve looked at so far deal mainly with non-fiction, but readers interested in good old imagination-based yarns have options as well. McSweeney’s ( ) has been available at the App Store for a while, but the app re-launched in January to run on the iPad as well as the iPhone and iPod touch. The latest edition of McSweeney’s also includes a small e-bookstore that offers novels individually formatted for the iPad and iPhone, relieving readers of the monotony of seeing all their books set in the exact same font and font-size. You can share news of your favorite stories on Storyville. Other apps in this genre offer more proof we’re living in a grand age for storytelling. Narrative ( ), a free app from Narrative Magazine, contains top-notch essays, stories, poems, cartoons, and more, with contributions from writers such as Sherman Alexie, Tobias Wolff, and William Carlos Williams. There are no in-app purchases with this offering—just lots of high-quality content. On the downside, you can’t share any of this free stuff via e-mail or social networks. But the writing here is so good (and free) that Narrative deserves to be downloaded by lit lovers. Finally, there’s the Storyville app ( ), which costs $5 for every six months of use. Each week brings a new short story to the app from independent and established publishers, featuring writers Ben Greenman, Anthony Doerr, and more. Unlike Narrative, Storyville does allow readers to share news of their favorite stories. 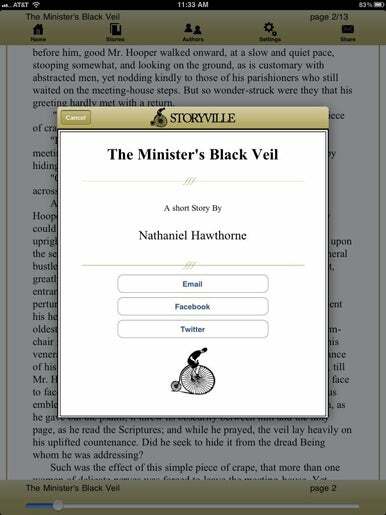 But like Narrative, Storyville offers high-quality content that will give iPad readers their money’s worth. So who says we’re losing our ability to read deeply? With the iPad in hand, fans of good writing have no shortage of free and cheap reading material to occupy their time.